I left off the last post with a little question about how many voxels I might need to represent a planet. There were a few guesses of 4.7810528e+20, 9.8782084e+17 and 10^21 which at first glance seem absurdly large but in fact they were pretty close to the mark. You see the thing about voxel data is it's big. Very big. Apart from the inherent inefficiencies of using GPUs to render voxels with raycasting when they would generally be much happier doing what they were designed for and be rasterising triangles, it's the amount of memory voxel data sets consume that prohibit their use in many scenarios and while that's pretty much accepted wisdom and hardly newsworthy - I thought it might be interesting to just take a moment to put out there some cold hard numbers. To encompass a maximum data set of 25,000 Km cubed I am using 22 levels of detail each offering eight times the number of voxels of the previous one (i.e. twice the number along each axis). The lowest detail level uses a 19^3 grid of voxel bricks each of which is 14^3 voxels in size so the entire lowest detail level provides 266^3 voxels. Dividing the 25,000 Km region by this equates to each voxel encompassing a cubic region of space 93.98 Km on a side (830,185 Km^3). That's pretty big! So obviously the lowest level of detail is pretty coarse but even at that low detail level there are 266*266*266 voxels making up the space which equates to 18,821,096 individual voxels. So that's nearly Twenty Million voxels for just one very crude detail level! 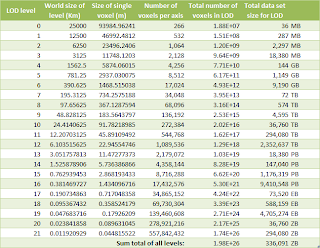 So to put it another way, storing the full 25,000 Km sized cube of space at a maximum detail level of 4.5 cm per voxel would take 173,593,970,549,359,000,000,000,000 (173 million billion billion) voxels taking a mind boggling 294 Zetabytes of storage just for the distance field! Putting that astronomical number into real world terms, if you burnt it all to dual layer DVD disks and stacked them on top of each other the pile would be nearly five times as high as the distance from the Earth to the edge of the Solar System! I know the cost of hard drive storage continues to decrease but I'm pretty sure I can neither afford that sort of storage nor fit it in my PC! 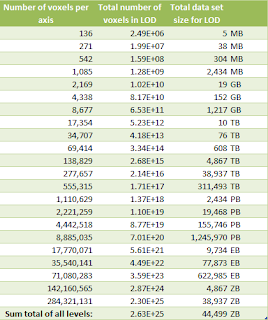 Which while better is still pretty extreme at a cool 39 Zetabytes - but let's keep going anyway. These numbers are for the entire cubic space but planets are conventionally round so with the volume of a sphere being (4/3)*PI*(Radius^3) our Earth sized planet has a volume of 1,083,206,916,845 KM^3, just 52.4% of the entire cube volume. Making this assumption that we are only interested in a hollow shell of data is a great optimisation both of storage and rendering performance because instead of tracing the ray through the entire cubic data set we can first intersect it with the outer sphere of the planet's data shell and start tracing from there removing the need to store a great many of the distance samples. Assuming there aren't any holes in the shell you can also ignore any space inside the shell as you're bound to hit something solid before getting there. 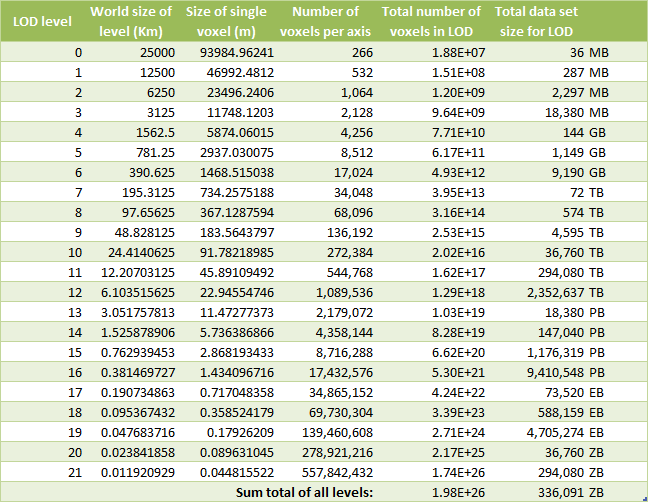 Some basic calculations shows that for an Earth sized planet an 18 Km thick shell takes up just 0.23% of the planet's bounding cube and has a volume of about 9 billion Km^3 requiring something like 1.017E+23 voxels taking 172 ZB at two bytes per voxel. Damn, that's still pretty large. This estimation is pretty crude as it doesn't take account of the topology of the actual terrain which will allow many more bricks to be discarded and there are basic storage optimisations such as compressing the brick data but no matter which way you look at it you simply can't store brick data for a whole planet at this kind of detail. There is also a major downside to all these assumptions of course - we are restricted to sensible planet shapes with sensible features which is a shame as being able to create crazy shaped planets you can travel through the core of sounds like a lot of fun. Even though my efforts at the moment are on conventional planet shapes therefore I'm taking care to make sure there are no artificial restrictions in place that would preclude more radical geology. These limitations are simply optimisations to make the data set more manageable and easier to generate (i.e. faster) while I develop the system, pushing the boundaries of what's possible is a large part of this project's raison d'être. Although all these crazy numbers make this project sound like an exercise in futility, remember that these are for the highest 4.5cm per voxel detail level. Each level lower takes only 1/8th the amount and of course you only need high detail data for the immediate vicinity of the viewpoint; the key therefore is to have a system that can generate brick data on demand for any given position in the clipmap hierarchy. Combine this with a multi-tier memory and disk caching strategy and you get something usable. Remember also that one of the benefits of clipmaps is that the memory overhead for rendering is fixed regardless of detail level. I support ten renderable levels from the set of 22 so it makes no difference whether I'm rendering levels 0 to 9 or level 12 to 21 the overhead is the same. Finally, you're maybe wondering why bother to store the bricks at all when there are some pretty cool projects out there showing what can be achieved with noise based functions directly on the GPU such as iq's Volcanic. The main reason I'm sticking with them is that I want to be able to add all sorts of voxely infrastructure onto my planets such as roads, cities and bridges which are hard to do dynamically in real-time but also because I want to experiment more with creating truly heterogeneous terrains rather than the fairly homogeneous looking constructs real time noise tends to favour. That's the goal anyway. I realise this has been a pretty dry number-heavy post so +1 if you're still with me, hopefully the next one will be a bit more visual. 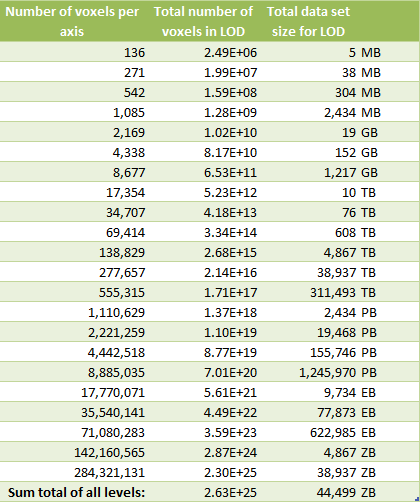 I think you could also consider using compression to reduce the amount of data you are really storing by a truly massive amount. 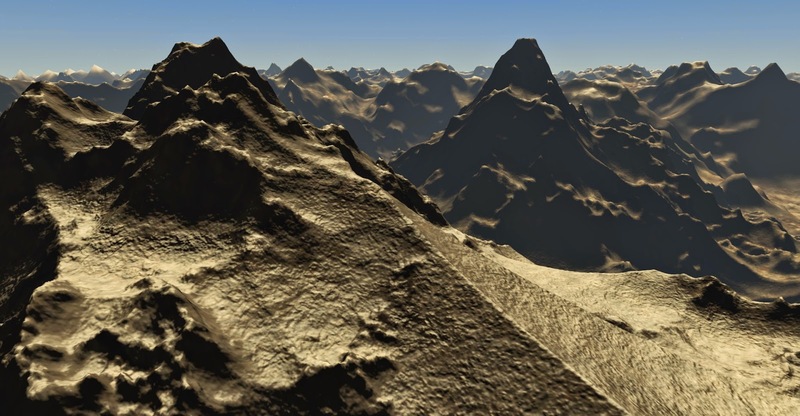 Another thing to think about: Use procedural detail generation for areas of the planet that have yet to be modified. That is to say, use your noise functions up until the player actually goes and interacts with it. Or better yet. STILL use procedural generation algorithms, but then modify the result with the stored changes a player may have made. That way you get the best of both worlds. I've been thinking about this stuff in the exact same thought path. Though I've been considering 'fields' of data. The only data stored would be surface topology down to maybe 1m at a side. Everything else is generated on the fly trough seed points. "forest starts here, with seed XXXXX" that kinda stuff. Then have generated detail based on material types and terrain seeds. But for everything underground and even the material itself... defined by fields. Giant boundaries that define volumes. anything inside of it is one material or another. Within that field sub fields are possible, say the area is primarily gabbro, inside of it might be concentrations of metal ores. Hi! I have a technical (ish) question. I get that most of the difficulties when rendering voxels is how to store the data and how to load it efficiently. Now, I'm also a bit obsessed with the idea of procedural generation of planets and other celestial bodies, and I wonder if couldn't we avoid the problem altogether by describing the planet completely by equations.